As Christine Barthe observes, “In the first ten years of photography, from 1841 to 1851, many travelers would try their hands at daguerreotypes outside Europe. Guillain’s photographs, taken in very difficult conditions, are not always perfect from a technical point of view, but they nevertheless represent the pioneering works in the history of photography.” They offer extraordinary insight into the people, the policies, and the places along the east coast of Africa during the mid nineteenth-century. Khamis Ben Osman; Syed Seliman Ben Ahhmed, Governor of Zanzibar; Aziza, great niece of the Governor of Zanzibar. (Khamis Ben Osman; Syed Seliman Ben Ahhmed, Gouverneur de Zanzibar; Aziza, petite nièce du Gouverneur de Zanzibar.) A. Bayot, lithograph after daguerreotypes ; Guillain, Charles (1808-1875), photographer ; Arthus Bertrand, editor. In: “Voyage à la côte orientale d’Afrique” / surveyed and written by Ch. Guillain, folio-atlas, plate 29; 1856-1857. From September 29 to October 13, 1847, during a visit to Zanzibar, the focal point of interest of his 1846-1848 expedition campaign, Guillain was regularly hosted by Syed Seliman Ben Ahmed, the governor of Zanzibar. Guillain’s daguerreotypes were taken in the courtyard of the governor’s mansion. 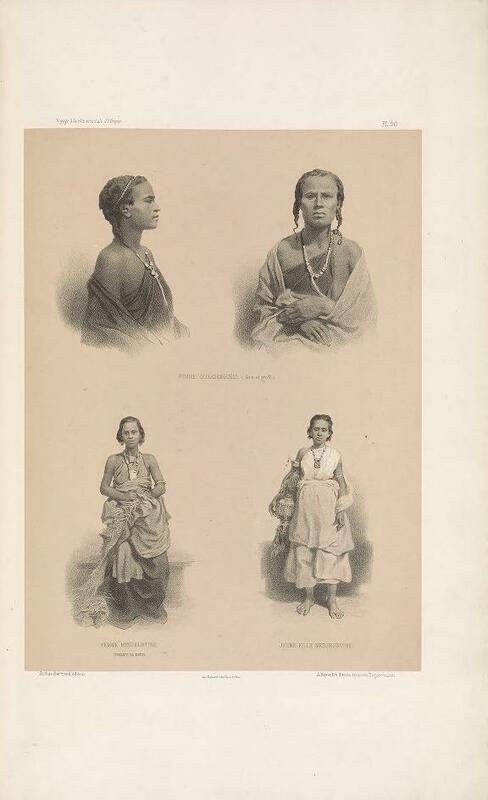 These photographs portrayed a lavishly dressed seven year-old girl named Aziza -Syed Seliman’s own great niece-, several of the governor’s concubines, in particular two women from Abyssinia (Amkara and Gourague), as well as the governor himself. Additional photographic sessions took place successively at the houses of Khamis Ben Osman, a prominent Zanzibari middleman and Arabic-speaking informant, and Abdallah Ben Ali, a Zanzibari trader and Swahili-speaking informant. According to Guillain, Sayyid bin Said, the Sultan of Oman and Zanzibar, declined the opportunity to have his own photographic portrait taken. Undeterred, he added the daguerreotype portrait of Henri Gustave (M’tongou; Oulet), a young Yao slave who joined the expedition as a personal attendant to the frigate captain and later accompanied Guillain to France. 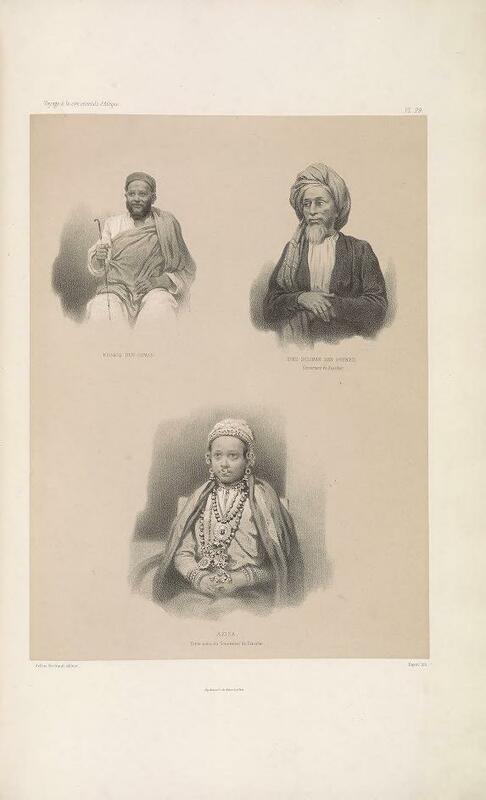 Read description of the portrait sessions at Zanzibar in Guillain’s Documents sur l’histoire, la géographie, et le commerce de l’Afrique orientale, tome 2, part 1, pp. 34 and 87; and tome 2, part 2, pp. 104-108. Ouarsangueli woman (front and profile view); Majeerteen woman weaving a mat; Majeerteen young woman. (Femme Ouarsanguéli (face et profil); femme Medjeurtine, tressant sa natte; jeune fille Medjeurtine. Bayot, lithograph after daguerreotypes ; Guillain, Charles (1808-1875), photographer ; Arthus Bertrand, editor. In: “Voyage à la côte orientale d’Afrique” / surveyed and written by Ch. Guillain, folio-atlas, plate 23; 1856-1857. From February 1 to 20, 1847, Guillain, having completed the survey of several cities along the west coast of the Indian subcontinent, started his investigations of the Somali coast by first visiting the small harbors of Abd-el-Kouri and Ras Hhafoun. 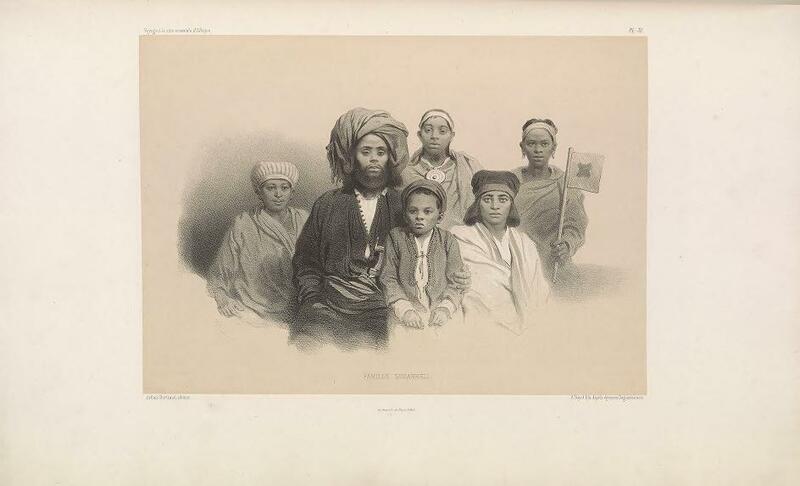 In the latter, Salem, an Arab who had resided there with his wife for thirty years, served as a liaison between Mr. Vignard, the expedition’s Arabic-speaking interpreter, and the Majeerteen (Medjeurtin) Somali community. Guillain’s first daguerreotypes were taken on the deck of the frigate “Le Ducouëdic.” A few Majeerteen men as well as three women reluctantly brought on board by Salem, posed for portraits. The youngest, a twelve year-old unnamed girl, was Salem’s own daughter. According to Guillain, the difficult behavior of his female subjects, not willing to follow the conventional portrait postures dictated by the photographer, exposed the polished copper plates to elevated temperature and particularly intense luminosity, thus affecting the final quality of the daguerreotypes. Read description of the portrait sessions at Ras Hhafoun in Guillain’s Documents sur l’histoire, la géographie, et le commerce de l’Afrique orientale, tome 2, part 1, pp. 414 and 416. 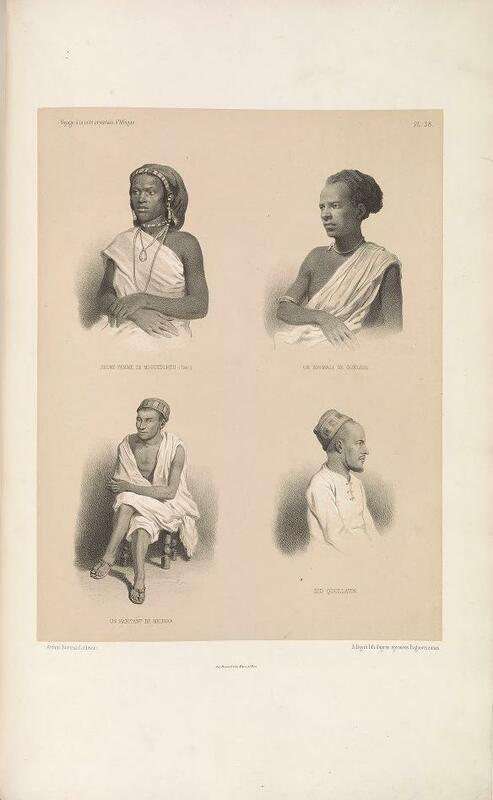 Young woman from Mogadishu (Teri); Soumal from Geledi; Merka inhabitant; Sid Qoullatin. In: “Voyage à la côte orientale d’Afrique” / surveyed and written by Ch. Guillain, folio-atlas, plate 38; 1856-1857. From January 25 to February 2, 1848, during his second visit to Mogadishu, Guillain was again hosted by Sherif Sid Hhadad, a member of the prestigious Ashraf community and a prominent trader in the Shangani (Chinggani) quarter of the city. Setting up his temporary photographic studio in a large room of his Somali host’s mansion, Guillain photographed Teri, the concubine of a local rich merchant, and Sherif Sid Qoullatin, an experienced Somali middleman/broker and Arabic-speaking interpreter. According to Guillain, upon arrival to Mogadishu, the daguerreotype materials had deteriorated due to excessive saltwater exposure, affecting the chemical process occurring on the copper plates. As an unfortunate consequence, the extended length of the portraiture session including Teri resulted in the concubine being severely punished by her infuriated and jealous master. Sherif Sid Qoullatin, a relative of Guillain’s abbaan (host/patron), and also a member of the Arabized Ashraf elite, mediated in favor of the French captain and his party under very difficult circumstances. At the time, the main Somali towns were regularly under siege as a result of the conflict between the militant Islamic reform movement lead by Haji Ibrahim, the religious leader of the community of Bardheere (today, Bardera), and an armed coalition led by Yusuf Mahamud, the Sultan of Geledi. Read description of the portrait session at Mogadishu and references to Sid Qoullatin in Guillain’s Documents sur l’histoire, la géographie, et le commerce de l’Afrique orientale, tome 2, part 1, pp. 537 and 545; and tome 2, part 2, pp. 56, 64, and 74. 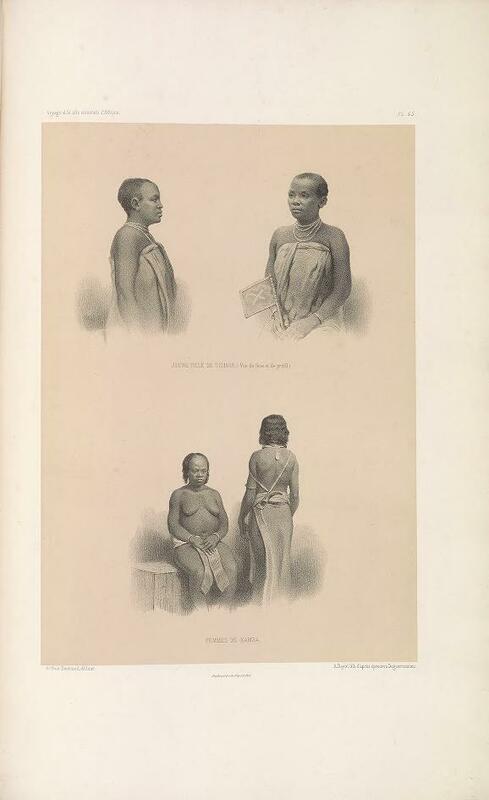 Young Chaga woman (front and profile view); Kamba women. In: “Voyage à la côte orientale d’Afrique” / surveyed and written by Ch. Guillain, folio-atlas, plate 45; 1856-1857. For example, an engraving plate (plate 45, see above) displays a young Chaga woman who, according to Guillain, was on various occasions invited in his apartment to perform sensual dances for his guests. The plate also displays two Kamba women. They were the wives of Sultan Kivoï, an African trader visiting Mombasa to sell ivory tusks. The trader and his retinue were invited on board of the frigate “Le Ducouëdic,” and were lavishly entertained. Read description of Charles Guillain’s sejourn at Mombasa in Guillain’s Documents sur l’histoire, la géographie, et le commerce de l’Afrique orientale, tome 2, part 2, pp. 208, 64215-217, and 288. In: “Voyage à la côte orientale d’Afrique” / surveyed and written by Ch. Guillain, folio-atlas, plate 31; 1856-1857. Between 1846 and 1848, Charles Guillain, assisted by Vernet, the helmsman of the frigate “Le Ducouëdic,” took a series of daguerreotypes while on an expedition along the coast of east Africa. These daguerreotypes are portraits of African and Arabic people of all ages and gender. They were taken during a remarkable period of intense experiment in the development of photography that started on January 1839 when the physicist François Arago, during a session of the Académie des Sciences de Paris, presented a new process developed by the French inventor Jacques Daguerre. The daguerreotypes were to modify people’s perception of the world and its representations, both in artistic and scientific fields. In 1887, twelve years after his death, Guillain’s daguerreotypes were accessioned to the collections of the Laboratoire d’anthropologie du Muséum national d’histoire naturelle. They unfortunately fell into oblivion, except for succinct records of transfer within French museum institutions including Musée d’ethnographie du Trocadéro (1878), Musée de l’Homme (1932-35), and finally Musée du quai Branly (2004). In 2003, more than a century later, the Musée d’Orsay in Paris, in collaboration with the Metropolitan Museum in New York, organized the exhibition, French Daguerreotype. A Photographic Object. The exhibition sought to consider the daguerreotype in all its diversity and featured three hundred works by Daguerre and other pioneers of the years 1839-1860, including for the first time photographs taken by Guillain in Africa. In 2007, the Musée du quai Branly hosted an exhibition featuring fifty-three remarkable daguerreotypes from the museum’s own photographic collections. Dr. Christine Barthe, curator of Camera Obscura, first daguerreotypes from the period 1841-1851, presented a series of African portraits taken by Louis-August Bisson (1841-42), Edouard Thiesson (1844-45), and Charles Guillain (1846-48), investigating the many links between the fine arts and the use of daguerreotype for ethnological studies. 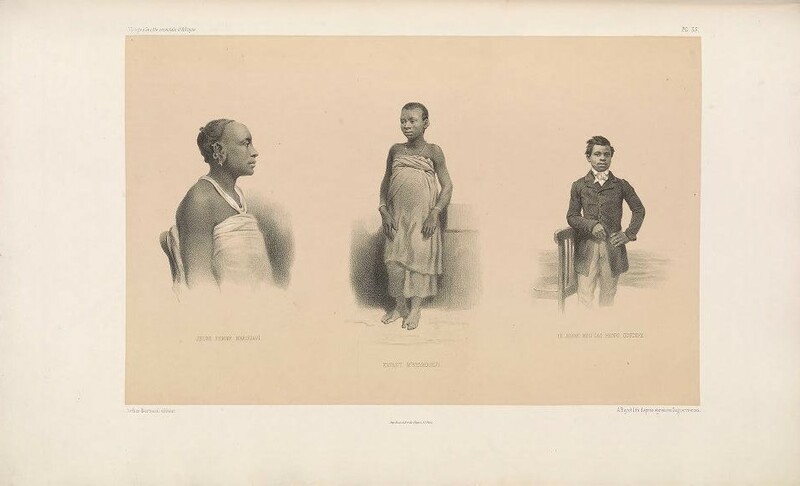 Young Wakwavi woman; Nyamwezi child; the young Yao Henri Gustave. In: “Voyage à la côte orientale d’Afrique” / surveyed and written by Ch. Guillain, folio-atlas, plate 35; 1856-1857. – EDWARD Elizabeth, Anthropology and Photography 1860-1920, London, Yale University Press: Royal Anthropological Institute, 1992.